Constitution Day (Jura de la Constitución) is one of the public holidays in Uruguay. It commemorates the promulgation of the original Constitution of Uruguay on July 18, 1830. The independence of the Eastern Republic of Uruguay was officially recognized in 1828 by the Treaty of Montevideo. The Constituent Assembly tasked with drafting the constitution of the newly independent republic was summoned in Iglesia de la Aguada, Monvetideo in 1829. The first Constitution of Uruguay came into effect on July 18, 1830. It established the country as a unitary republic and introduced the separation of powers. The Constitution also provided for a two-chamber General Assembly. It was empowered to elect a president for a term of four years. The 1830 constitution remained in effect until 1918. New constitutions were adopted in 1918, 1934, 1942, 1951, 1967 and 1997. The 1967 constitution was temporarily suspended during a period of dictatorship that lasted from 1973 to 1985. 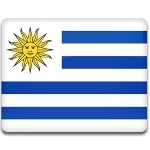 The current Constitution of Uruguay was adopted in 1997. Basically, it is the 1967 constitution with a number of amendments. Uruguay Constitution Day is marked with official celebrations in the capital city of Montevideo and social events, such as marches, parades, open-air concerts etc.